APA Roundtable: Can We Fix the General Plan Process? 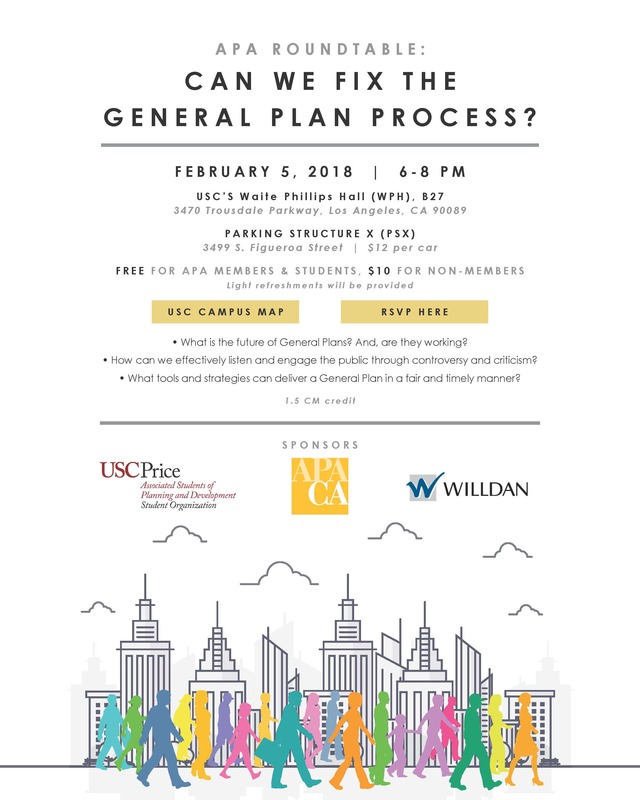 Join APA Los Angeles, municipalities undergoing General Plan Updates, and experienced consultants for an interactive forum where we’ll explore better ways to communicate the role of planning and the function of General Plans, and discuss how we as planners can steward the public process. What is the future of General Plans? And, are they working? How can we effectively listen and engage the public through controversy and criticism? What tools and strategies can deliver a General Plan in a fair and timely manner? Transit: Take Metro Expo/Blue Lines to the USC/Jefferson or USC/Expo Park Stations. Parking: Use Parking Structure X (PSX) at 4399 S. Figueroa Street. $12 per car. Cost: Free for APA members and students. $10 for non-members.